Liam had the radiation simulation done on Monday, and the face mask made. I mentioned before that kids Liam's age generally get anesthetic every day for their radiation. 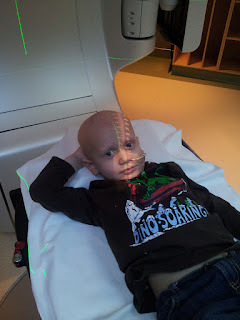 But, Liam has done a couple of MRIs and CT scans without anesthetic, so the radiation team is willing to help us try to do radiation without the anesthetic. It's not like we are committing to no anesthetic, if he starts getting upset or anything, we just arrange for the anesthesiologist for the next day and forward. 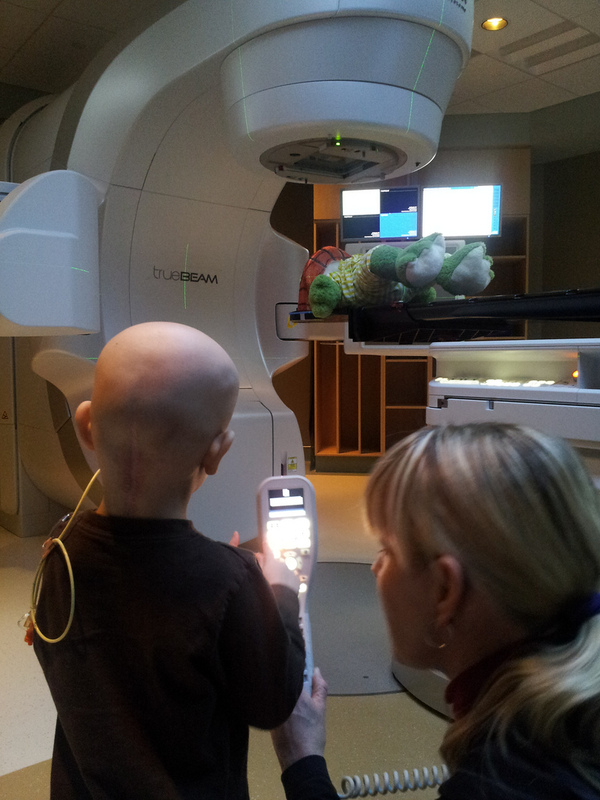 The radiation team suggested that we get Liam used to the room with the machine (we have a wonderful radiation therapist). Troy took Liam to the Tom Baker, and Liam got the opportunity to play around in the room with the machine. Liam played with the bed controls (moved it up and down, etc). 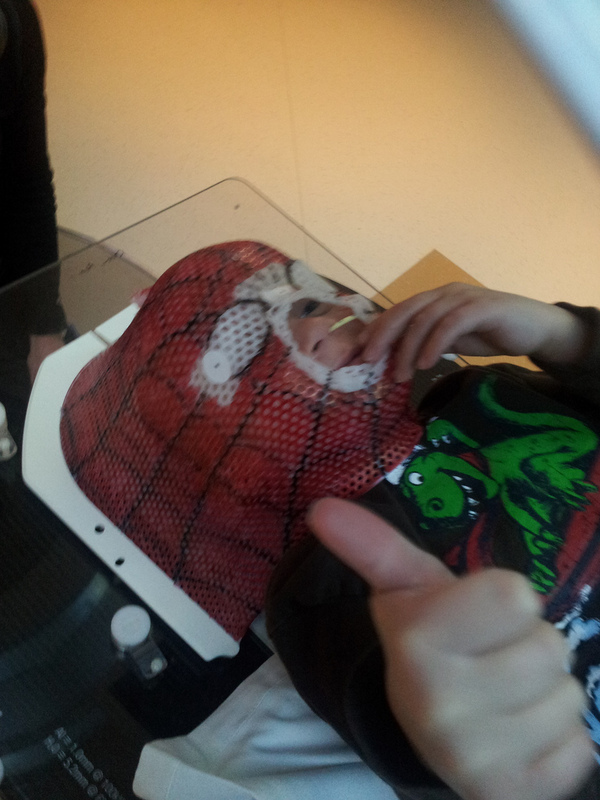 Liam even laid down on the bed and put the mask on! 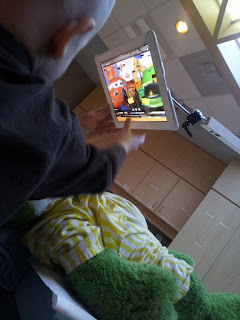 There is an iPad mounted on the machine, which Liam can see through his mask, so he sat and watched Cars. I don't know how well I would handle laying there with a mask holding my head to the bed! But, I try my hardest not to show my feelings and we are trying to make it all seem fun. They even have a giant frog Felix that they use to demo putting the mask on, and they gave Liam a small frog to match him. If Liam can do it, it would be great not to have anesthetic. The actual radiation only takes 15 minutes. If Liam gets anesthetic plus radiation it would take around 1 1/2 hour. On Monday, when he had anesthetic, he was still unable to walk without falling until about noon, so that would be tough every day. We have no expectations, he is 4 years old and this is a lot. But, it is worth a try. It is looking like radiation will start on Wednesday, daily for about 6 weeks. Felix is up on the bed of the machine and Liam is moving the bed around. Liam was quite impressed with all the lasers. Look at this kid giving Dad a thumbs up! A volunteer paints the masks for the kids, it's the little things that help.